Replete with its fair share of suspenseful slash-n-stalk moments, Death Carries a Cane (1972) is an utterly enjoyable giallo from director Maurizio Pradeaux, distinguished by some outrageous characterizations and a few memorable 'quiet place' kill sequences. 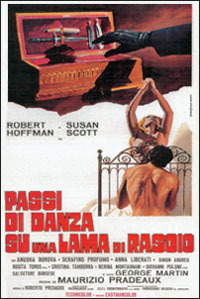 Susan Scott (Death Walks in High Heels) and Robert Hoffman (Spasmo) effectively headline the cast as the couple drawn into the sticky web of the cane-wielding murderer. Out sightseeing with some relatives, Kitty (Scott) takes the opportunity to see if she can locate her perpetually tardy boyfriend Alberto (Hoffman) using a coin-operated telescope. Scanning the rooftops below, Kitty stumbles across a horrific scene: inside an apartment builing, a black-clad killer is brutally knifing a helpless woman! Kitty and Alberto report the murder to the police. The cops discover the dead girl...her name was Martinez. Meanwhile, the news leaks out that a tourist had accidently snapped a photograph of the killer as he left the scene of the crime. The picture reveals a figure dressed in black hurriedly rushing down the sidewalk, knocking over the goods of a street vendor (played by Gualtiero Rispoli). Unfortunately, the killer sees the front page newspaper photograph...and he wants to make sure no one talks. The chestnut vendor eats dinner alone at home. A cane raps at his door. The vendor is surprised to find no one there. Then, another knock. Cautiously, the vendor goes to the window and looks out...is someone playing a trick on him? From bloody prints made by a cane at the scenes of the crimes, the authorities conclude that the killer must be an invalid with some sort of leg limp. Marta the old cleaning lady (Nerina Montagnani) contacts Alberto by telephone. Does he want to know who the killer is? Because SHE knows. Visiting her, Alberto gets the scoop. In exchange for her disclosure, Marta wants $2,000. Come back with the money, she tells Alberto - and she'll reveal all. But the killer has his ears to the wall...he diposes of Marta and seals her silence once more. Soon, due to a one-of-a-kind handbag, a prostitute is identified from the newspaper photograph, but she too is slashed as she tries to report her knowledge of the psychopath's identity to the police. Death Carries a Cane is literally brimming to the rim with colorful characters that demand the viewer to answer the question: is this person the killer? Is that person important? Friends of Kitty and Alberto are music composer Marco (Simon Andreu) and journalist girlfriend Lidia (Anuska Borova). There's also Lydia's disgruntled twin sister Silvia (Borova once again) who sports a cane as well. One of the more rewarding strengths of Cane is its sure mix of interesting death sequences. Out to quiet anyone who might have seen his harried flight from the crime scene of the Martinez girl, the killer seeks the chestnut vendor in his humble home, canes him by the neck - and brutally slices open his neck with a straight razor. Likewise, loose-lipped Marta wants some bucks to spill the beans. So the killer keeps her silent by slashing her neck wide open and letting her blood spill freely...but not before the poor woman errantly grabs the razor with her bare palm in a grimace-inducing moment. The climax of Cane is surely one of its stronger moments. Seeking refuge from the killer inside a darkened greenhouse, Kitty crouches amongst the foliage in a state of sheer panic. Outside...the killer's flashlight scans desperately, beyond the thin glass walls. The camera spirals around on Kitty's face...pure terror. The killer breaks the glass. With Alberto locked inside the Okrowich school, no one is available to rescue Kitty. She is sitting bait. Death Carries a Cane is also known as The Tormenter, as well as Pasos de danza sobre el filo de una navaja.